This entry was posted on Saturday, October 13th, 2012 at 4:47 am	and is filed under Actionscript, AS3, Flash, Programming. You can follow any responses to this entry through the RSS 2.0 feed. You can leave a response, or trackback from your own site. I’ve been running into a bunch of problems like this for any project that is using the new ASC 2.0 compiler. 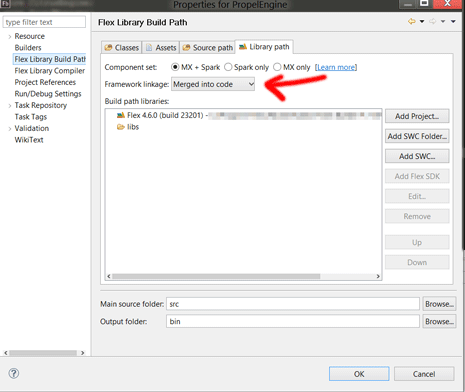 Particularly with projects that are using Flash IDE compiled SWCs or like in your case, HAXE compiled SWCs. *Usually* doing a Project – Clean will resolve the issue for me, at least temporarily, but it is a major annoyance. That and the incompatibility with SourceMate, but that is for ElementRiver to fix, I suppose.